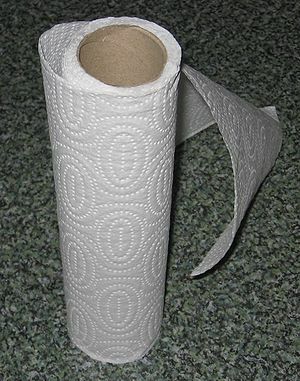 I just read an article on do-it-yourself paper towel substitutes, where you sew up some fabric towels of the right size to fit on your paper towel rack, and then you attach the towels to each other via snaps, velcro, or buttons. (Could be a great learning-to-sew buttonholes project..) It inspired me, and I thought of doing it next time I tackle my sewing project box. But then one of my kitties threw up, and as I cleaned that up with paper towel, I thought that I’m not at the stage of saying a total goodbye to paper towels. I do like the ones you can get now that are half-sized, though. So I think what I’m going to do is to hem up a bunch of reasonably attractive rags, of varying fabrics from terry to knit to plain cotton, and keep them in a small basket in the kitchen, right near the paper towels. Then we can make an instant choice as to what we want to use. I bet my paper towel usage will drop to about 10% of what it is now! The article, which is nicely written and illustrated is here: DIY Faux Paper Towels. By the way, if you don’t sew, it gives some sources for buying such towels. Then I looked around the site and found another interesting one on washing your hair with baking soda, which I plan to try. I happened across the blog because I like to keep tabs on the daily digests from Chris Martensen’s Peak Prosperity website, by getting his weekly email newsletter. A lot of it is big picture stuff which I tend to skim or ignore (feeling probably wrongly that I know enough!) but I always find some specific project or idea. Today it led me to the towel idea and the shampoo to try.